The high today it 63 I am happy to finally be able to really wear my sweaters that have been tucked away all year. Make things ahead of time. It saves you so much time and sanity. I did this the night before Thanksgiving and because of that I was able to just sit and relax with my family and watch the parade on TV since everything was already prepared. IT was great! 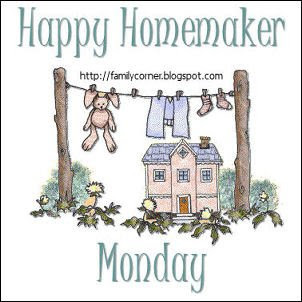 Please stop by and visit Sandra to see what other Happy Homemakers are up to. Have a great Monday!